Mr. McNicholas is the Managing Director of Phoenix Group in Panama and Costa Rica, Pathfinder Consulting, LLC (USA), and Sirran Communications CALA, S.A. and CyberSecurity Group (Central America/Mexico/Colombia). Michael has over fourteen years of distinguished and progressive Law Enforcement, Military, and Intelligence experience and, most recently, twenty plus years as Founder/Co-Founder of several successful professional security and technical sales/services communications corporations in Latin America and the USA. A former Non-Commissioned and Commissioned Officer (Presidential Direct Appointment) in the US Army, Mr. McNicholas served for nine years in Airborne Infantry, Military Police, and Military Intelligence units. Mr. McNicholas is a former sworn Police Officer and held a TOP SECRET security clearance in the Central Intelligence Agency (CIA), where he specialized in counter-narcotics trafficking and international terrorism and served on the Vice President’s Narcotics Interdiction Task Force and as the CIA Liaison to US Coast Guard Intelligence. 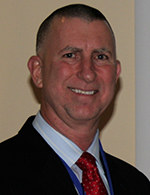 Michael designed, implemented, and directed the internationally-acclaimed seaport security program at Manzanillo International Terminal – Panama, the largest container port in Latin America, and deploys a 160 man force (security officers, K-9, intelligence, and management) at the seaport. Mr. McNicholas spearheaded the successful efforts to have Phoenix Management Services Group designated as the first “Recognized Security Organization” by the Republic of Panama Registry and the Dominican Republic (UN/IMO classification). Mr. McNicholas is credited with co-pioneering the Maritime Security Team (Anti-piracy/stowaway/drug trafficking/terrorist) concept in commercial cargo shipping in Latin America (based at Phoenix Group Costa Rica). Currently, his personnel provide security onboard over 500 ships per month in 11 ports in Latin America and McNicholas’ personnel have captured 600+ stowaways and drug couriers, seized over 10,000 kilos of cocaine & heroin, repelled armed pirates in combat on two occasions and denied access in a dozen other pirate attempts, and mitigated two terrorist operations. In June, 2008, Mr. McNicholas was selected by the Office of the US Secretary of Defense (OSD) as a Maritime Security SME and later that year trained the USCG’s International Port Security Assessment Command. In 2009, he was a speaker/panelist at a multi-day conference on Somali piracy at the JFK School of Government at Harvard University and in 2010/2011 he conducted presentations at NATO’s “Centre of Excellence – Defence Against Terrorism” in Turkey. In 2012, Mr. McNicholas Chaired/lectured at the inaugural conference of the “Multinational Maritime Security Centre of Excellence” (MARSEC COE) in Turkey and currently he is a member of the Centre’s Academic Advisory Board and continues to lecture there on an annual basis. In December 2012, Mr. McNicholas lectured at a joint US ODNI-Naval Intelligence conference on Commercial Maritime Drug Trafficking and in 2013 he was selected by the US Maritime Administration/USMMA/ USCG to be a member of a five-person Subject Matter Expert team to develop the new Facility Security Officer Course Instructor Manual and Guidelines (ISPS/MTSA). Mr. McNicholas has lectured at Harvard University, Johns Hopkins University, the Pentagon, DIA, NATO, USMMA King’s Point, and at numerous conferences sponsored by the Office of the US Secretary of Defense, US Department of Homeland Security, the Office of the Director of National Intelligence, and the Shipping Industry. Mr. McNicholas is the author of: “Maritime Security: An Introduction”, (McNicholas, 2008, Elsevier, Inc./Butterworth-Heinemann), published in English and Chinese; “Port Security” (Chapter 13) of “Port Engineering: Planning, Construction, Maintenance, and Security” (Tsinker, Gregory, 2004, Wiley and Sons, Inc.,); “Terrorism and Commercial Transportation: Use of Ships, Cargoes, and Containers to Transport Terrorists and Material”, (NATO Science for Peace and Security Series, Vol. 98, 2012); “Use of Commercial Shipping by Terrorist Groups and their Cooperation with Other Terrorists Groups and Transnational Criminal Organizations”, (MARSEC COE, Global Maritime Security: New Horizons, 2014, Turkish Naval Forces Printing Office); and several feature articles in “Homeland Security Today” and “Cargo Business News”. Mr. McNicholas graduated from the University of Baltimore with a Bachelor of Science Degree and a Master of Science Degree in Criminal Justice. Instrumental in design and development of the Naval Key Distribution System (NKDS) local area workstation. This provided the U.S. Navy with the capability to securely create and manage electronic cryptographic key material and was adopted as part of the architecture for the National Security Agency’s Electronic Key Distribution System (EKDS) to replace paper key formats.